Best Friends Winnurz these two weekses! Atrion Darnay, a hooman of the geek breed just like mai hoomanz, though I undurstand there iz slight variationz in geeks just like there iz wif tabbiez. Here iz hiz Geeks Webpage. iTrixie, a papillon doggie frum the woofsite iTrixie.com, of course! Forever Foster, who iz cats who host foster kittenz and blogz abouts them until they iz reddy to be adopted at Forever Foster. Congratulations, I hopes you like mai book! Let me know when you gets them. Iz nearlee 1030 on Monday but I wuz busy today so I didn't decide on a Monday Mission until nao, after talking wif Kittyanydots. Hoomans seem to think I gets lots uv thingz done. I don't get az much az I would likes done, I wish I wuzn't tempted to take so many naps, but sumhao I gets moar done than sum otherz so I thought this Monday Mission shud be abouts that. When I dooz stuff, like a project, there iz seven parts to it. The Idea iz when you gets a flash uv inspiration. Iz when two thingz collide in your head and makes a third thing that iz bigger than the two thingz. There iz no such thing az anything original because everything we make buildz upon sumthing from befoar that has collided wif sumthing else from befoar. Iz important fur artists to understand this becuz it releases you frum obligation and stress. You do not needz to be original az much az you needz to make sumthing better from two other thingz. Then your style will takes care uv itself and that iz the original part. The Brainstormingz iz when you mix these thingz in your head and gets moar little ideas that will helps you. Iz a good idea to listen to music when you do this becuz music encouragez your brain to wander and put together connectionz. Iz also a good idea to do this in the middle uv the night when you iz tired or when you are about to fall asleep. You wants your brain to connect moar thingz than normal in unusual ways. Once it doez, you has to pick a time to stop the Brainstormingz and start the Preparationz. Many talented artists get stucks here. Sum fur their entire livez. You need to say to yourselfs, "I iz starting in two dayz whether I iz ready or not." If you don't, you will never be done thinking. You will be sumone who thought about starting to dream about doing sumthing great instead uv sumone who does sumthing great. Iz a trap. Pick a deadline to start and sticks to it no matter what happens. The Preparationz iz when you puts togethur your suppliez and stuffs. Sumtimes it haz research material. Sumtimez it haz your physical toolz. But like befoar, your brain iz the most important. You has to have a time and place set aside to do this that izn't used fur anything else. And you has to dress fur work. When you has sumthing you wears just fur wurking on a project and you wearz it in the time and place it helps your brain concentrate. The Big Strokes iz when you start working on the project. Thiz iz sketches or scripts or outlines or big globz of paint. Whatever you iz working with. If your Big Strokes require a lot uv thought, like if you iz making storyboards or you iz putting together details fur a character in a storee or you has to make sure sum spreadsheets haz the right formulaz, iz not a good idea to listen to music heer becuz music encouragez your brain to wander. You do not wants to think about two things at once when you has to concentrate on one thing. The Little Strokes iz when you has the big stuffs in place and nao you fix it up. You don't do little things until the big thingz iz taken care uv. Iz like decorating a cake befoar you bake it, silly! Once you has baked a cake, you lets it cool. Then you coverz it in frosting. THEN you puts on the decorations. If you puts on the roses befoar you bake it the cake will be ruined. The Abandonment iz hard to explain to anyone who isn't an artist. Art iz never finished. At sum point you has to give up and leave it where it iz. Iz never going to stay purrfect. What may be purrfect one minute will be imperfect again when you come back a minute later after a different thought comes in your head. You has to move on and let your art be. Almost az many artists get stuck here az get stuck between Brainstormingz and Preparationz. Pick a deadline and finish it. The Boring Stuffs. Every project haz boring stuffs. In writing this iz editing. In picturez it starts with fixative or mat cuttingz or making different resolutionz fur the internets. Then it movez on to trying to sell it. Selling iz very boring. Iz why sum people puts it off or doesn't work very hard at it, including me. No one likes to write cover letterz and tee shirt descriptions but it haz to be done. No one likes cleaning up, either, but it has to be done, too. This is why every Tuesday I has no projects scheduled. I has Procrastination Day instead. I wurks on stuffs like selling and public relationz and letterz I shud have written but didn't cuz I wanted to make a cartoon instead. I also puts imagez on tee shirts and writes descripshuns. I does file backups and deletes or throws out sketches that went nowherez. I inventory and order art suppliez or printer ink or paper. My Monday Mission iz to plan a noo project fur January uzing this breakdown. I already haz the idea. Iz a book abouts caring fur hoomans. Nao I haz to get it moving. Wish me luck! Sunday Comic (In VIDEO!) Crispmouse Speshul. This iz frum 2006, befoar Mayday and I becamez a couple. I mades hur sum needlepoint and I sings a little song bai Frank Loesser. Also I iz wearing a snazzy Crispmouse sweatur! Here iz the Catster page if you wants! Iz Furiday, which meanz it's time fur aminal newz! I hazn't had time to make videos in awhile cuz it iz the holiday seazon and everything. I knows the hoomans look forward to them and I will do some new ones and post sum old ones az soon az I haz the time. But anywayz, I know anyone following mai blog or mai Twitter must be interested in kitty videos of sum kind so I wanted to point out sum cool thingz. Cats 101 premieres on Animal Planet this Saturday at 8 PM Eastern and Pacific time. Iz all about cats, the same az their series Dogs 101 is all abouts dogs. But even better, if you iz a hooman bored at work and missing your furry family, you can visits Cats 101 or Dogs 101 on the internet and play trivia games, do puzzles and watch videos. As long as you don't gets in truble fur that sort uv thing. Or you can waits until you get home and play wif the hooman kittens so they learns sumthing. They also haz a video podcast abouts all kinds uv aminals, not just cats and dogs. There iz lots uv Animal Face-Off and Meerkat Manor stuffs there. LOTS. So there iz lots uv aminal videos to watch while I gets around to reposting mai furst video and mai musical Crispmouse video frum las year fur you. (I has to fit it in between naps.) Nao I don't feels so guilty. My kitteh's eyez R nothing like teh moon. Salmon iz far moar red than hur lips' red. if whiskerz wires, black wirez grow frum hur head. But no such fishies C I in hur cheeks. Than in the breath that frum mai kitteh reeks. That music haz a far moar pleazing sound. My kitteh, when she walks, padz on the ground. Az any she belied wif false compare. Yes, it really wuz on TV in front of 40 million hoomans or something. No, I didn't make any monies fur it. Iz not about the monies. Iz hosted at You Tube and comments is allowed cuz CBS owns it and that's where they had the contest. I can't move it. But the visitorz has spoken in mai recent poll so frum nao on I will sumtimes post videos at You Tube fur your convenience but I will not allow comments there. I wouldn't reads them, anyway. I allowz comments at Catster and Livevideo and I have free video downloads at archive.org and mai podcast. Monday Mission: I haz tics... in mai pants! We all haz verbal tics. "Like", "And so", "fur real", "anyway", "nowamsane". Mai problem iz I say "you know?" a lot. A LOT! As if it wuz a punctuation mark, you know? "You know, I has a lot uv work I should have gotten done this past week... in mai pants." If you does this enough it will cure you uv your tics. Or it will make you look crazy and no one will talks to you. Either way, you know, your tics haz gone... in mai pants. Droopy iz back! She wuz living in the woods by a neighbor's house. Shadow-Mayday haz been gone 3 weeks. It's been our experience we probably won't see hur again, especially given the evidence after hur disappearance that I would rather not think about. Mayday iz the title we give our farm queen so Droopy will now receive that title. Our first farm queen after the Great Skunk Scare was born on May 1 along with two brothers, a white one named Beltane and a black and white one named Walpurgis. So she got the title Mayday. But we are very happy to have Droopy-Mayday back, as you can imagine. She must have been frightened into hiding. Mai primate had to drive by and call to hur where they saw hur and still it wuz hours befoar she showed up. But she iz heer nao in the warm kitty house and we hope she decides not to wandur into ditches fur awhile. Heer iz the free one. Enjoys! 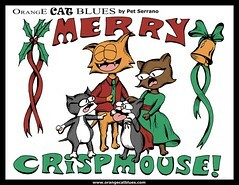 Noo at Zazzle: Merry Crispmouse! OK, I know iz early, not Sunday OR Crispmouse yet. But mai last post wuz depressing so I wants to put up mai cartoon. Or since I can'ts imagine anyone buts mai primate wants to wear this, you can gets one free to share at Flickr. I post it soon. This blog post is not fur kids or sensitive aminals and adults. Skip it if you don't wants to be sad. Srsly. Also I iz being uncharacteristically political today. It's hunting season in South Dakota. Hoomans can get a license to hunt deer and pheasant and cats here. This iz why I learned to walk on a leash. They iz supposed to hunt only feral cats to control their population. The problem iz that it is legal to hunt from a car or truck, as long as it is somewhat away from a residence. In the city, feral cats usually live near dumpsterz, and dumpsterz iz too close to residences to hunt there, but in the country feral cats rarely follow the roads because they iz scared of hoomans and cars. So what they end up hunting iz "ditch tigers". Farms and ranches have to have cats working fur them to control the inevitable rodent population attracted to their produce or feed. Queen cats teach their kittens frum the first day which sounds and smells are dangerous, then they teach them hao to hunt. There iz no better mouse trap on the planet than a cat. Farmers try to keep kittens around that are fast, smart, short-haired and dark or orange furred, who aren't allergic to tick treatments and who have no other genetic traits that will make them targets fur predators. They need to be friendly enough to be handled fur vaccinations and sumtimez to get Afrin fur respiratory infections. Tom cat spray helps warn predators away from litters of kittens. It's a delicate balance and a hard life fur a cat but far from hao hard a life feral cats have. Most farmers consider it cruel to take a shelter cat and drop it off outside with no experience. It's like dropping off a 4-year-old hooman child in the middle of a city where they don't speak the language. Without a coat or money. So they breed their own cat staff. Without cats on a farm, sometimes feral cats will domesticate themselves, but more often skunks move in. That only has to happen once before you make sure you get some cats from another farm. Srsly. They are not allowed to shoot cats with collars, but collars attract the attention of hawks, owls, foxes and coyotes. Farmers have to decide whether their cats have moar to fear from the wilderness or man. So anyway, there has been no sign of foxes or hawks here lately, but there has been lots of gunshots and we is not far from the city (relatively) and only 3 miles from a paved road and Mayday and Droopy, both fond of hunting in the ditches where the ground squirrels live, are missing since we heard the shots. And it's November. It is possible they are gone fur good. Lazarus's father wuz shot in the face last year but he survived. Somehao. Writing letterz to the South Dakota government may be the first thing you think of, but it's not the best idea. They don't have a viable alternative fur cat hunting licenses right nao. What they will want befoar they consider removing the cat hunting option is an alternative that works. The best thing in mai opinion is to help The Alliance for Contraception in Cats and Dogs develop their contraceptive shot. This will allow inexpensive Catch-Neuter-Release near the dumpsterz in the towns and cities where population control is most needed while allowing farmerz to keep their feline workers safe while they are doing their jobs. I purrsonally believe non-surgical sterilization is the future of pet population control and hope to see it purrfected in mai lifetime. It would save so many kitties and puppies from starvation and euthanasia in shelterz and in feral colonies. I also believe legislators in South Dakota and other places with population control problemz will listen when this alternative is presented. It is a clean, elegant and inarguable solution for all concerned. Hoomanz iz designed wif one mouth and two earz. You would thinks they would listen twice az much az they talks. It would solve most uv their problemz. I dids the last one a few times, acshully. Mai primate noticed that it made hur ask moar questions about what other hoomans did outside uv work fur their life's wurk. 2. a related but neutral topic you can use to naturally change the subject to something lightur. Could be a hard mission but also could be useful in many situations in the future. I iz on a wurking vacashun! I iz taking a little vacashun while I helps mai primate. I might pop in to Twitter but mostly I will be away frum the internets almost 2 weeks. I iz helping hur get hur todo list catched up. Part uv it iz done already wif helping me redo mai website and wif setting up the Twitter prizes, but nao iz time I help hur. Plus there iz a promise of treatses. But does not has an ear. she wearz Chews on hur feet. I gots an award from Forever Foster! Here it iz! This lovely award is created by Crystal @ Memoirs of a Mommy in honor of Noah and the donor of his sweet little heart who ENCOURAGES us to SHARE THE LOVE! The rules for this award are to pass it along to some people whose blogs you love. They make you laugh, smile, leave encouraging comments on your blog. You would like to share some love with them because they have uplifted, inspired, encouraged or prayed for you. Please include this paragraph with the link to Memoirs of a Mommy so that everyone knows where this award originated from. The kittehs at Paws and Effect who do great wurks helping with kitteh advice. Lian Xin fur being generally cool. She iz a painting Chihuahua wif a gentle soul. and Kittyanydots who iz a noo friend who helps aminals at Etsy. Oh! and iTrixie, who doesn't has a blog yet but just gots her woofsite running. Don't confuse UR Life's Wurk wif the place where UR employed, K? Srsly. Don't confuse your Life's Work with the place where you are employed. Clicky Piccy to rate if U wants. Kthnxbai! Loki's Monday Mission: Shut Mai Mouth! Let me know if you dooz it. And if anything interesting happens. Try going longurz if you can dooz it without sounding like a wierdo. Don't worry if you can'ts do it right away. You has all week. Monday Musing, no, wait--- Mission! I has just had an epiphany, just a minute ago, just befoar my "Monday Musing" blog post that I scheduled in advance wuz abouts to post itself. Sumthing about "Monday Musing" seemed too similar to "Wednesday WOW" fur mai taste, then it hits me, "Monday Mission". I can puts up sum mission fur the week startings on every Monday Morning, sumthing I wants to work on myself, so anyone who wants to join in and try sum social experiments to make the world a better place can try it wif me and post their results. The way it iz in mai head nao, some missions will repeat all week, sum will be just until I find the answer. Or you, if you iz doing it, too. If you tend your own garden instead uv worrying about your neighbor'z garden your neighborhood will fix itself. Then your community will. Then your country will. Then the world. Sumtimes all it takes fur your neighbor to start weeding iz to see you iz growing flowerz. Iz OK to right-click the picture and repost it if you wants to try it, too. Iz ok fur any species to try it. I actually did make this to hang in mai bathroom. I've started using the transparency feature of PNG files to make mai comics customizable. All the blue parts on this one can be changed to any other color. I picked red to match mai towelz. Oh My Dog! I can't believe I never posted this on mai blog! 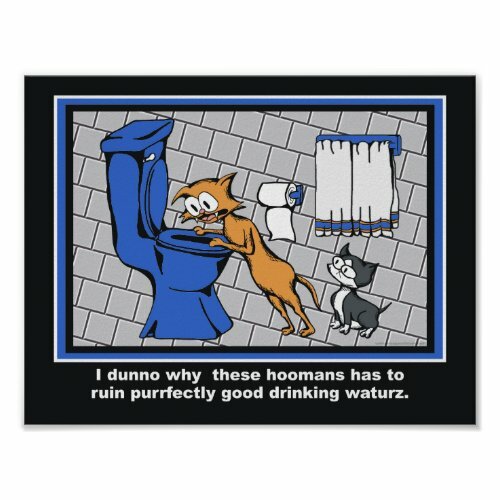 Caturday On Hoomans: Do Hoomans Live too Long fur their Own Good? Awhile ago I used to put videos on You Tube a lot. But that place earns their monies by comment count and controversy. I'z not interested in controversy, nor in helping a company earn monies when they earn monies by silently promoting hate and abuse and copyright theft until they get caught. I switched to Livevideo and Catster for mai videos. The thing about Livevideo and Catster is they rely moar on sponsorships than on controversy so they have no need to support hate and abuse and theft. Sure, there are purrsonality conflicts. There are always purrsonality conflicts in any group. Even groups of two. But the thing is for some reason at Catster and Livevideo flaming is the exception, not the rule like it is at You Tube. I think it's because justice is swift. Accused trolls at Livevideo get locked. If they can explain themselves, like if they have been unjustly accused, they get their accounts back. If not, their existence is completely wiped out. I mean, all comments are erased as if they never existed. Iz the only time trolls think they iz wasting their time so I thinks they mostly give up and slink back to You Tube. Nao, I don't want you to think stoopid comments at You Tube hurt my feelings. They almost never had anything to say about me, and even if they did, they are weirdos on the internets. Who carez what they think? Turns out, lots of hoomans do. I don't get it. In mai comments the hoomans all argue wif each other. Some of them iz stoopid, but some of them iz smart, too. The thing that botherz me is it takes the smart ones so much time to do it. It's the idea that so many hoomans are wasting their time that offends me. Lots of them have the potential and purrsonalities to affect real change someplace if they would use their righteous indignation someplace where it's needed. There iz still hooman slavery going on. There iz still genocide going on. There iz still toxic chemicals poisoning the future. There iz still kids who don't get enough food. There iz still corporations wif moar rights than people. There iz still aminals being hurt for fun, and there iz still hoomans who need someone to make them laugh today. I talks directly to the hoomans nao: Please, as a cat I don't beg much, excepts fur chickawn, but I am begging you hoomans to use your spare time and energy to be a part of something important. I dunno why so many of your species waste your time this way. Iz it because you live so long? Cuz I can tell you, I only have twenty years, maybe, I never waste a chance to nap or play or cuddle or make a hooman smile. I iz not saying I'm better than you but maybe you didn't see this opportunity so you iz wasting time on the internets arguing with hoomans who don't have your potential. You could be fixing something real and broken. Nothing gets fixed just by arguing on the internets. It just gets moar broken. Anyhoo, on their deathbedz no one ever sayz they wish they spent moar time arguing on the internets. I'm sure of it. I haz a poll about hao to deal with comments at You Tube on mai website in the lower left if you iz interested. Here iz a poem I wrotes abouts mai sistur. He sat down beside hur. Threw him up on the carpet. As some of you know, I've been exchanging text messages and announcing updates at Twitter. I started following Animal Planet there and won an advance copy of the pilot episode of Whale Wars. This is a Critter News Review. I was really looking forward to this series since mai primate showed me an episode of Carl Sagan's interstitial science classic, Cosmos, and I learned that whales had a worldwide communication network thousands of years before we cats domesticated ourselves in Egypt. Too bad the engines of most ships are on a frequency that drowns it out. The whale history of long-distance communication makes my little vlog look way lame. But I digress. The 7-part series filmed over three months in 2007 and 2008 documents the nearly annual campaign of Captain Paul Watson and the crew of the Sea Shepherd Conservation Society's ship the Steve Irwin as they battle Japanese whale hunters off the coast of Antarctica. The laws in international waters are applied inconsistently by different countries. Japanese whaling ships claim to be hunting in the name of research, even prominently displaying the English word "research" on the sides of their ships. Sea Shepherd contends that the Japanese research vessels are a cover for commercial whaling. This is not the kind of show you'll be interested in if you view animal rights activists as eco-terrorists. Sea Shepherd was founded by a guy who was kicked out of Greenpeace for being too radical. In the premiere episode, the crew of the Steve Irwin is almost entirely comprised of newbie volunteers whose first major battle is with seasickness. Once they get their sea legs they go through a series of training exercises in how to throw Sea Shepherd's weapon of choice, the stink bomb, and get a crash course, literally, in freezing water rescue when a training accident goes terribly wrong, sending a few members of the crew overboard and damaging the helicopter they use for reconnaissance, effectively blinding them to the whereabouts of the Japanese fleet. After 41 days at sea and a few nasty phone exchanges with a rival Greenpeace ship, they receive an anonymous tip that leads them to one of the harpoon ships. The episode starts and ends with a teaser promising hostages and gunshots. While coverage of controversial subject matter like Whale Wars can easily slip into dry appeals for fundraising or a washed-out overview with little substance, after watching the first episode, this series has been well-presented, as we've come to expect from Animal Planet. Educational, but prolly not good for very young children because there are some graphic images of whale slaughter and bleeped swears. If the subject matter is something you want your kids to learn about you should prolly watch it before they do. Entertaining: The animation wasn't done yet so I can't comment on that, but the crew are a varied group each with their own opinions and they make for good drama with a few chuckles. Non-preachy, although clearly one-sided because of the nature of filming it doesn't come off as a fundraising attempt. and as for our wild-paw rating, I didn't want to get up to use the litterbox or get a snack, so one more paw for exciting. I was on the edge of my tower. Thats a purrfect 4-paw rating from Critter News for adults, 3-paws for kids because it gets a little bloody. This is the kind of reality TV I like. Humans actually doing something. Whale Wars premieres Friday night, November 7th, at 9PM Eastern and Pacific on Animal Planet. Watch video at Animal Planet. For more on Sea Shepherd, visit their website. Loki wonders about the First Puppy, gives some shoutouts, and talks about an upcoming review of an advance copy of Whale Wars from Animal Planet. Also, bonus footage at the end of kitten cuteness: Laz dressed as a Killer Whale attacking a baby harp seal toy. The toy was unharmed. Some Loki cartoons from 2006. This first appeared (in greyscale, which seems moar artistic somehow) in Young American Comic's Big Ol' Book of BIZMAR. Contestants had to include a bunny, insect,zombie, monkey, alien and robot in a 2-4 page comic. It is still available here! Oh, and US citizens, don't furget to vote! Visit your Secretary of State's website to make sure there isn't a problem with your registration and to confirm your polling place if you haven't voted already. November 4th is the last day to vote no matter where you live or what party you belong to so be sure to request a provisional ballot if there is a problem with your registration. Your greatgrandkittens are going to want a story from this election so make sure you get to the polls and don't disappoint them. How to vote in the US Presidential election without leaving your house. Reposting (prolly weekly) because it's important. In a lot of states you can even vote NOW if you want! You don't have to wait until election day. I has been away frum teh computer fur a bit. I am testing out using Blogger frum mai mobile fone. Iz a touch screen uv corse. I has truble wif teh keys on teh fones designed fur primatesez. I hasn't figured out hao 2 reply 2 comments whilez I iz away but I will be back later cuz I luvs talking 2 commenturz. It looks liek I haz a lot uv blogz 2 follow soon also! Noo shoutouts coming on Thursday. There iz a writer wif an idea 2 do a noo Loki book based on Fargate Trekwars. We iz thinking uv calling it SPACECATS XTREME! or somefing less lame. The Lennox Independent put an article about my book on the FRONT PAGE! So in honor and thanks I dug up the interview I did with their resident Feline columnist, Todd the Office Cat. Hai gize! It's Loki! And I'z tired, K? Sry I have been away. I had visitors fur awhile liek my cousin Tipsy who is part Siamese so she talked ALL THE TIME and I never got my naps! 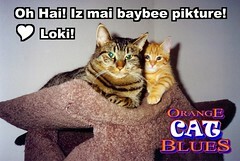 Loki explains how to walk on a leash and how to hunt wild catnip is this Critter News Special. Hi guys, it's Loki! And you're watching Critter News for June 25, 2008. In California yet another Chinese Crested has won the increasingly popular Sonoma-Marin annual World's Ugliest Dog contest. Gus, a pedigreed dog rescued from a life in a crate by a Florida mother and daughter, competed against 12 finalists from around the US. Gus won purely based on his looks, having lost one eye and leg in addition to having the unconventional semi-hairless appearance typical of the Chinese Crested breed. Gus is currently being treated for skin cancer and his primates are putting the $1600 prize toward radiation treatments. Mussels are growing in Ohio. 1,700 endangered northern riffleshell mussels from Pennsylvania are being electronically tagged and released into Big Darby Creek. The mussels live in less than 5% of their former range, much of their natural habitat having been destroyed by dams and reservoirs and many remaining mussels being suffocated by silt from strip mining, logging and farming operations. Monitoring is being paid for by a federal grant. Attention kitties! Ever wanted to be on a game or reality show like your primates? Now you can! Meow Mix is holding auditions for cat and human teams for their "Think Like a Cat" game show. Cats will be tested on camera-friendliness, presumably after a long trip in a cat carrier. Humans will be tested on how much they think like their cats. Upcoming audition areas include Tampa, Dallas, Denver, Portland, San Francisco and Los Angeles. Think like a cat will air on the Game Show Network on November 15. And now it's time for true or tail, Chinese Crested Trivia! Which statement is false? The same litter can produce the Chinese Crested Hairless and the Chinese Crested Powderpuff. The Chinese Crested Hairless is related to the Chihuahua. The Chinese Crested known as "Sam" was so popular his death made CNN. The second statement is false. Although both breeds have no hair, they are not related. Hairless and powderpuff Chinese Cresteds often appear in the same litter, and Sam, who survived being branded "unadoptable" to win the contest several times, did have his death reported on CNN. Sam and Suzie's story is credited with inspiring others to adopt unadoptable animals. Hi guys, it's Loki! And this is Critter News for June 19, 2008. Residents of Battle Creek, Michigan were surprised to see what they thought was a young leopard wandering through their neighborhood on Tuesday. Animal Control trapped the animal, which turned out to be an injured and malnourished 5 year old African wildcat called a Serval. A Serval of this age should weigh about 30-45 pounds but only weighed 15. Experts report he is likely an escaped or abandoned pet as he was neutered and had been declawed. While the owner has not stepped forward, Servals are crossed with Bengal cats to create the popular hybrid, the Savannah, a good-natured cat with a pack animal mentality that takes to the leash well and even enjoys swimming. Because Michigan state law does not regulate exotic animals there are several catteries in the state specializing in Savannahs, Servals and Bengals. I personally hope the owners will be able to provide authorities with some clues as to who may be missing their pet Serval. If no owner is found Mr. Serval will receive care and a new home at an animal sanctuary. A USDA report states that although some causes have been ruled out, there are still no conclusive leads as to the cause of Colony Collapse Disorder. CCD is the generic name given to the mysterious illness that causes the sudden deaths of all mature honeybees in a colony. Immature bees are not affected. Although honeybee health has been on the decline for about a quarter of a century it has been only recently that complete collapse of a colony has been commonplace. Theories have included increased pesticide use, increased packing and trucking of colonies to agricultural sites during pollination time, the Israeli acute paralysis virus and Varroa mites. As no single cause has been identified, researchers are now looking at fatal combinations. Honeybees have succumbed to colony collapses in the past but there is no historical data to support or refute the possibility CCD is a cyclical ailment. Honeybees are directly responsible for 15 billion dollars worth of berries, nuts, fruits and vegetables annually. Although Bald Eagles are no longer on the Endangered Species list, Jane Fink Cantwell of Birds of Prey Northwest is going to great extremes to save Beauty, an eagle found starving in a garbage dump after a poacher shot off her top beak 3 years ago. Beauty cannot preen her feathers and has to be hand-fed to survive. Nate Calvin, a mechanical engineer, was moved by a lecture about Beauty and offered to create a prosthetic beak for her. Beauty was fitted with a computer-designed prototype last month, slipped onto pins glued to her remaining beak. Although the final beak will not be strong enough to allow Beauty to return to the wild the prototype has already allowed her to grip her food more easily and drink on her own. The Beauty and the Beak project accepts donations via Paypal. Visit the websites for details. And now it's time for True or Tail, All About Eyes: Each of the following statements is both true and false. Which fact is true and which is the tail? 1. Honeybees can see in the infra red and ultra violet spectrums. Honeybees can see in Ultra violet, but not Infra red. Bees can't see red at all and will not pollinate red flowers. 2. Pet food manufacturers put color in cat food to make it more palatable to humans because cats are colorblind. True, color is added to cat food to fool humans, but not because cats are colorblind. Cats can see color, we just don't care. We'll eat anything that smells good! 3. An eagle's eyes contain about 5 times as many cones in the fovea that make eagles better at detecting small movements than humans. True, then false. Although eagles have more rods and cones overall, it is the rods that are responsible for motion detection. Hi guys, it's Loki! And you're watching Critter news for Thursday June 12, 2008.
the Davis School of Veterinary Medicine of the University of California. Lyons collected samples of feline DNA from volunteers from all over the world. While genetic mapping will have major applications in feline and human medicine, another goal of the study is to find out how and where Felis silvestris became Felis Cattus. The program also features researchers in the field tagging wild cats to observe how they might domesticate themselves and various ways different breeds are related. Explorer: Science of Cats airs again the evening of June 14th on the National Geographic Channel. America's oldest African elephant died suddenly on Monday morning. Petal was a longtime resident of the Philadelphia Zoo and was due to be moved to the International Conservation Center late this summer. Video footage revealed she stumbled and lay down early in the morning, unusual behavior for her as she usually slept standing up. All of her vital signs were normal as she slipped away. Officials at the zoo are still uncertain as to the cause of her death but she did live over a decade longer than she likely would have in the wild. Petal was 52. Happy Birfday! Methuselah, star attraction of the largest single collection of reptiles in the world, turns 127 years old this weekend and Reptile Gardens is having a celebration. Reptile Gardens is located on 30 acres just south of Rapid City, South Dakota, and features 200 species of reptiles, including Maniac, the largest crocodile in the Western Hemisphere, the only display of rough-scaled pythons outside Australia, and a fully enclosed jungle in the sky dome. Methuselah the Giant Turtle will be giving out free birthday cake and coke for kids, but he will be celebrating with watermelon. He was born on the Galapagos Islands in 1881. The Society of Vertebrate Paleontology reports possible evidence of a land-dwelling vertebrate that created burrows in Antarctica 250 million years ago. While not warm, Antarctica was at the time presumably ice-free. The first burrows were found in the Beardmore Glacier region about 400 miles from the pole. No animal remains have been discovered but the nature of the shelters makes the Thrinaxodon of South Africa a good candidate according to Cris Sidor, one of the project's researchers. The Thrinaxodon has the skeleton of a reptile and laid eggs but there is much evidence that the creature was warm-blooded, sported whiskers and was covered in fur. Additional burrows have been found in the Victoria Land region and point to a mole-sized reptile known as a procolophonid. And now it's time for True or Tail? Close Relatives. Which animal is most closely related to the South American saber-toothed tiger Thylacosmilus? Answer: Kangaroos. Thylacosmilus, meaning "pouched blade", was a marsupial and carried young in a pouch. Fossils are often found in Argentina. It is believed they became extinct after Smilodon, a sabre-toothed tiger from North America, invaded when a land bridge was created between North and South America. $24 million dollars has been set aside for compensation in the Pet Food Litigation case. It has received preliminary approval in New Jersey and Canadian courts are expected to approve the settlement by the end of June. If it is judged fair to the class, any pet owner who has lost money as a result will be eligible for compensation. The settlement covers all veterinary bills related to the case, including bills covering testing even if the pets turned out not to be affected. Receipts are not required but will help pet owners get the most compensation possible. Moist products by Menu Foods, Walmart, Eukanuba and others were affected by the fraudulent introduction of melamine into wheat gluten imported from China during the winter of 2007. The poison caused kidney problems and failure in thousands of pets. Aloha! Make your pet a star in Hawaii! Hawaii Pet Magazine is looking fur their next cover model. All pets living in Hawaii are invited to submit photos, regardless of species. The winner will be featured in their July and August issue. Deadline is June 7 and online voting begins June 9th. Pets are warned to hide their medication or make sure it is in human-proof containers and stored out of reach after an Iowa man took phenobarbitol prescribed for Saturn, his Jack Russel Terrier. Clarence Fenton of Des Moines crashed his SUV last November under the influence of the drug and was in court May 29th for driving while intoxicated. He claims he doesn't remember taking the pills. Veterinarians usually prescribe phenobarbitol for canine epilepsy. The Hoopoe is now officially the national bird of Israel. President Shimon Peres made the announcement Thursday after a nationwide election held by the Society for the Protection of Nature in Israel. Over 150,000 people voted and the hoopoe won with 35% of the vote against several other contenters. While the Hoopoe figures prominently in both Jewish and Islamic culture, primarily associated with King Solomon, it is not Kosher. And now it's time for True or Tail Trivia. This week's subject, National Birds. Benjamin Franklin suggested an animal other than the bald eagle for the national symbol of the United States. Was it the turkey, the rattlesnake or the horse? Contrary to popular belief, it was not the turkey. Franklin actually suggested the rattlesnake, an animal that had appeared on some Revolutionary war flags. The widely known story about the turkey comes from a tongue-in-cheek letter written to his daughter in which he pokes fun at a badly-drawn eagle. Which of these countries does not have an official national bird? Italy, the Republic of Ireland or South Korea. All of them. South Korea often is associated with the Korean Magpie, but it is not official. The National bird of New Zealand, the kiwi, is most closely related to: the emu, the loon, the dodo. The Emu. The kiwi is the smallest member of the ratite family. That's it for Critter News this week! 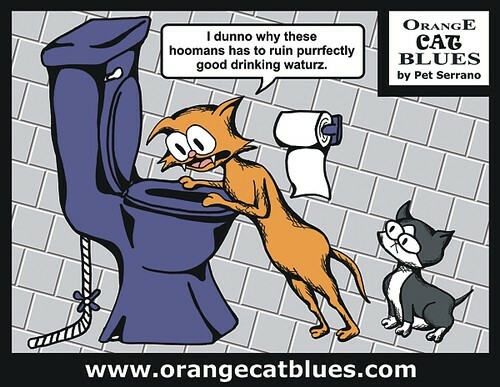 For links related to this broadcast and the answers to True or Tail Trivia, visit Orange Cat Blues.com. Read Ontario's Endangered Species Act. Code of Forest Practices of the Ontario Forest Industries Association. False: A group of meerkats is usually called a "mob". False: Meerkats are not immune to scorpion venom, although they do have a technique for safely snacking on scorpions. True: The Meerkat is the lead vehicle in a multi-vehicle system. The Meerkat detects landmines and vehicles traveling behind destroy them. National Flea Week is TRUE. The Turkey Crash is TRUE. The jaywalking deer defense is the TAIL.